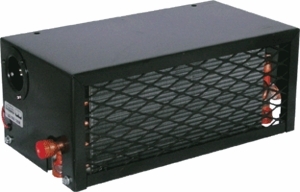 12, 24 or 36 Volt Hot Coolant Cab Heater. 33,000 BTU. Two-Speed Fan Control Switch Mounted on Heater. Twin motor operation 5-blade aluminum fan blade. Tube & fin water coil with Lifetime warranty 16" W x 6 3/4" H x 8 1/2" D. Installation hardware sold separately below.